A friend & colleague of mine, Ramon Presson, posted this on our No Mommy’s Perfect Facebook Group. I asked his permission to repost here for all to enjoy. 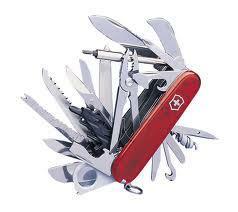 Ever feel like a Swiss army knife? This is my first day in 3 weeks, including weekends, that I haven’t been counseling, traveling, speaking, researching, or feverishly writing, and I can tell that I don’t know how to relax this morning. Have been up since 5:30 and going at a steady clip. Sometimes I think I confuse the difference between unproductive and really relaxing or recharging. I’m not complaining. I love all the things I do. Just learning that I have difficulty turning the switch off because there are always things to be done or that could be done. For business owners and writers there is always something more that could be done and be done NOW. I hear that most Moms feel the same way. To all the Moms today, God bless you. I hope you get some replenishing “ME time” at some point this weekend.